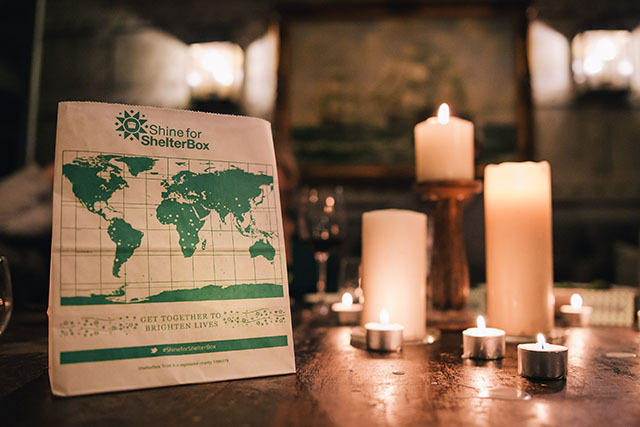 Now in its third year, Shine for ShelterBox is an annual campaign from Cornish (and global) charity ShelterBox, which currently has a team on the ground helping those made homeless by Hurricanes Irma and Maria. This year’s events kick off in October, with the aim of raising money for “people who need light in their lives”. Lucy Holden from ShelterBox, explains: “When disasters strike and power lines go down, families are left vulnerable. That’s why, alongside our shelter aid, we provide lights that dispel the dark and help families in desperate circumstances feel a little bit safer. You can’t underplay the importance of light in these situations. A simple solar lamp can make a huge difference in far reaching ways, including helping to reduce the threat of gender violence in camps and allowing children to play in safety – not to mention making it easier to cook and share a meal together. You can help by holding your own candlelit fundraising event. 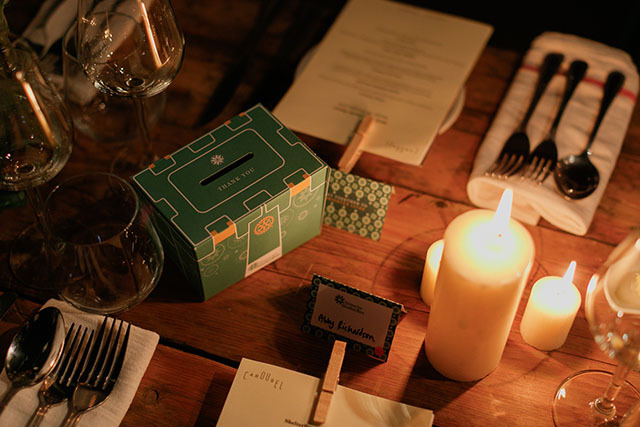 Visit the ShelterBox website to find out more about hosting your own event, be it a cocktail party with fancy nibbles, or a bonfire and hotdogs in the garden. You will receive a fundraising kit, invitations, place name cards, collection box, recipes and ideas to make your evening sparkle. The first event of the campaign will be hosted by Woodfired Canteen in Truro, with guests meeting in Calenick Street before being taken to a secret venue, where chef Ben Quinn will be serving up a wholesome menu to the centre of the tables. BYO drinks. Dinner from £25pp, book online. 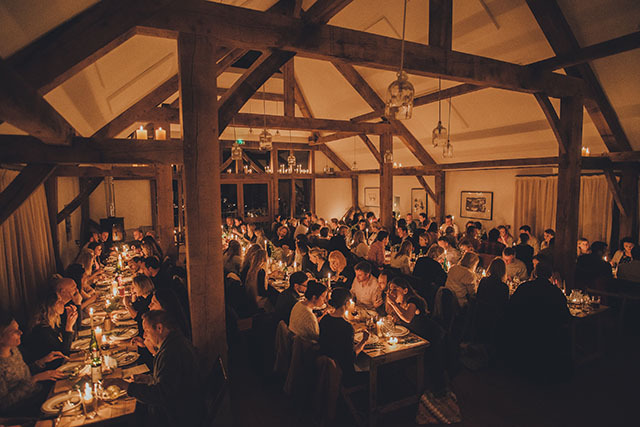 The menu for Nancarrow Farm’s Shine event is still to be confirmed, but expect a beautiful candlelit feast, featuring homegrown organic produce, in the magical oak barn (pictured above). Tickets will be available to buy online soon. Appleton’s at the Vineyard is one of our favourite restaurants, and Andy Appleton’s wonderful Italian cooking is always spot on. Appleton’s Shine event is an Italian feast, priced at £45 per person, with an optional wine flight for £3o, introduced by sommelier Gordon Lawrence. See Facebook for more info. The Ship Inn (pictured above) in Wadebridge is gloriously cosy in winter; expect a warm atmosphere, log fires and top notch pub grub. Tickets available online, £16.50pp, includes a main course and a £5 donation to ShelterBox. Last year’s event in Marazion saw the causeway across to the mount being illuminated for the evening. For 2017, The Godolphin Arms’ menu is Caribbean-themed, and priced at £27pp, book online. 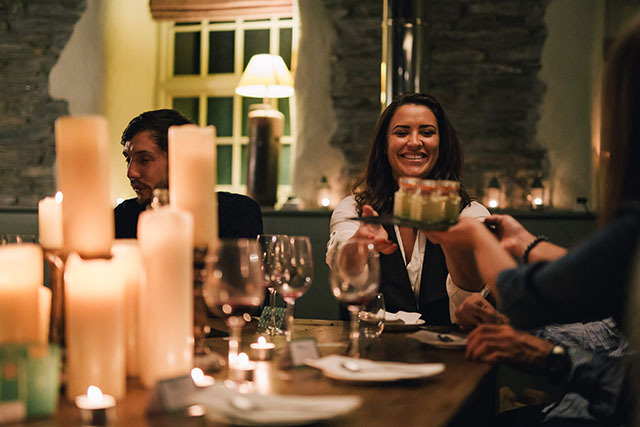 The menu for the candlelit supper at pretty harbourside restaurant Amélies in Porthleven will be inspired by the Caribbean, and accompanied by live music. Tickets are priced at £25 for three courses. For more info phone 01326 653653 or visit ameliesporthleven.co.uk/news. Every second, one more person is made homeless by conflict and natural disaster. That’s a total of around 85 million people, including women, children and babies, as well as whole communities, living without shelter. ShelterBox is an international aid charity that hand delivers emergency aid to families devastated by conflict or natural disaster, to provide them with shelter and tools to rebuild their lives. The charity is currently heavily involved in providing shelter for those made homeless by Hurricane Irma and Hurricane Maria, as well as supporting those affected by flooding in Bangladesh and Nepal, and helping families fleeing conflict in Iraq and Syria. Inspired by the charity’s LuminAID solar lights that are included in the ShelterBoxes, the Shine for ShelterBox campaign raises money to bring light and shelter to those who have lost everything. For more information, visit shelterbox.org.